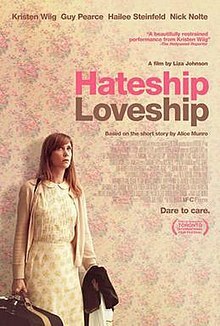 Hateship, Loveship is an American drama film directed by Liza Johnson and written by Mark Poirier, based on the 2001 short story "Hateship, Friendship, Courtship, Loveship, Marriage" by Alice Munro. The film stars Kristen Wiig, Hailee Steinfeld, Guy Pearce, Jennifer Jason Leigh and Nick Nolte. It premiered at the 2013 Toronto International Film Festival on September 6, 2013. On 11 March 2014, the official trailer for the film was released. Johanna Parry (Kristen Wiig) must move to a new town to begin work as a housekeeper for Mr. McCauley (Nick Nolte), an elderly man who needs help keeping house, and to be a caretaker for McCauley's granddaughter, Sabitha (Hailee Steinfeld). She meets Sabitha's father and McCauley's son-in-law, Ken (Guy Pearce), who does not live with Sabitha or McCauley, but instead resides in Chicago. Sabitha's best friend, Edith (Sami Gayle), tells Johanna (after Johanna asks where Sabitha's mother lives) that Ken's wife died several years ago. After inviting Johanna and Sabitha to dinner, Ken writes a friendly note to Johanna, which his daughter delivers. Johanna writes a response letter and Sabitha's friend Edith offers to take it to the post office and mail it. Instead, she intercepts the letter and, as a cruel joke, the two teenagers forge a love note from Ken, addressed to Johanna. Then they set up a fake email account for Ken (who does not have email). They impersonate him, responding to love emails from Johanna. "Ken" calls her "my only friend" but things may change when "Ken" asks Johanna to visit him in Chicago. The shooting of the film began in November 2012 in New Orleans, Louisiana. The film was shot with Arri Alexa digital cameras and Kowa anamorphic lenses. Michael Benaroya is financing the film. ^ "Hateship Loveship". Box Office Mojo. Retrieved 13 April 2014. ^ "Hateship Loveship". Toronto International Film Festival. Archived from the original on 4 March 2014. Retrieved 7 September 2013. ^ Jagernauth, Kevin (17 October 2012). "Kristen Wiig, Hailee Steinfeld, Guy Pearce & Nick Nolte Have 'Hateship, Friendship'". Indiewire. The Playlist (blog). Retrieved 21 July 2013. ^ Heuring, David. "Hateship, Friendship Framed in Anamorphic and ALEXA". VER (Fletcher Camera & Lenses). Archived from the original on 19 April 2014. Retrieved 18 April 2014. ^ Patten, Dominic (8 November 2012). "Benaroya To Finance 'Hateship Friendship'; Jennifer Jason Leigh Joins Kristen Wiig Pic". Deadline Hollywood. Retrieved 21 July 2013. Wikimedia Commons has media related to Hateship, Loveship.